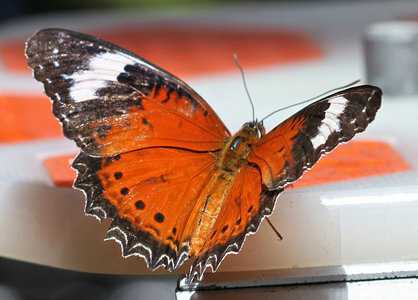 Cethosia penthesilea ranges from Java to Timor and northern Australia, but does not occur on New Guinea. The species formerly included C. methypsea of peninsular Malaya, but that is now considered a distinct species. Müller, C.J.,Beheregaray, L.B. 2010. 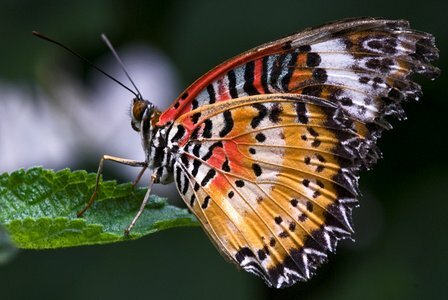 Palaeo island-affinities revisited - biogeography and systematics of the Indo-Pacific genus Cethosia Fabricius (Lepidoptera: Nymphalidae). Mol. Phylogenet. Evol. 57: 314-326. Parsons, M. 1999. The butterflies of Papua New Guinea: their systematics and biology. Academic Press, San Diego. Another tropical species, from NE Northern Territory; in the Melbourne Zoo butterfly house; on the feeder. captive, Long Sutton Butterfly Park, Lincolnshire, UK. Page: Tree of Life Cethosia penthesilea (Cramer 1777). the Orange Lacewing. Authored by Andrew V. Z. Brower. The TEXT of this page is licensed under the Creative Commons Attribution License - Version 3.0. Note that images and other media featured on this page are each governed by their own license, and they may or may not be available for reuse. Click on an image or a media link to access the media data window, which provides the relevant licensing information. For the general terms and conditions of ToL material reuse and redistribution, please see the Tree of Life Copyright Policies.